Sorting pictures into albums on your iOS devices is a good way to manage photos intended for different purposes, and some image editing apps like Snapseed and Instagram will create their own albums to help keep things arranged. It’s not uncommon for an albums purpose to evolve though, and what once may have held just a bunch of pictures for picture frame mode on the iPad may have slowly evolved into a broader place to store photos, making a name change appropriate. Renaming those photo albums isn’t entirely obvious though, so we’ll cover how to do this on an iPad, iPhone, and iPod touch. Before tapping on Done, selecting other albums will let you change their names as well. Changing an album name on the iPhone and iPod touch both look identical, and while doing this on the iPad is basically the same process, it looks pretty different because the albums are displayed in thumbnail views rather than lists. 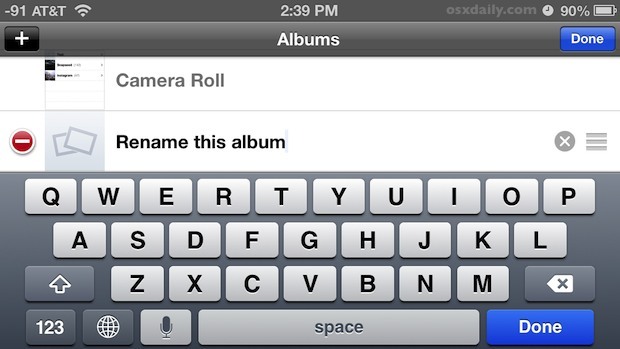 You can rename any album with the exception of Camera Roll, which holds all photos on the device. There are some cases where you won’t want to change the given names though, because some iOS image editing apps like Snapseed will create their own albums for photos altered or modified with those apps. As you may have guessed, if you change the name of those albums made by apps and then use the app again, that app will end up generating a new album with the apps name again anyway. You can’t rename the default photo albums included in iOS, that is probably why you can’t rename the photo album on the iPhone. For example if you try to rename Camera Roll you can not do that, nor can you rename Hidden or Screenshots or Videos etc. You can only rename the albums you add yourself to the Photos app. True, editing CAN be done on iPhone but NOT iPad. The only thing edit does in iPad is give option to delete the album. 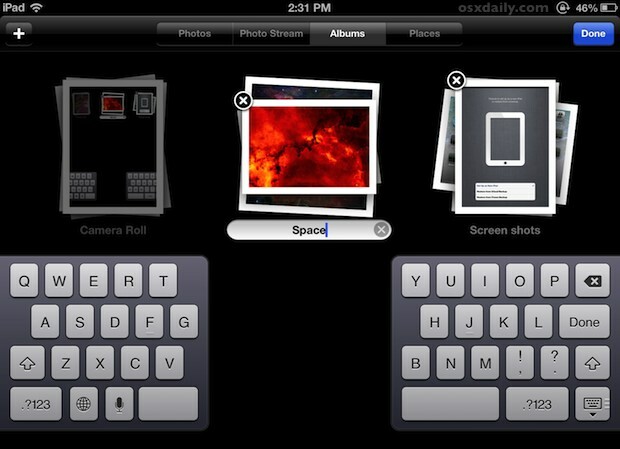 You can absolutely edit and change Photo album names on iOS for iPad and iOS for iPhone. iOS on the iPhone and iPad is the same iOS. It’s iOS. I am using an iPad right now, and I just used the directions as instructed to change the name of a Photos album on iPad. Tap “Edit” then tap the photo album name, the keyboard shows up, rename the album, tap Done. Simple. So that makes several of the commenters here totally wrong, which is typical of internet commenters who seem to never read the article. When I click Edit on iPad 12.1.1 it grays out the album name so I am unable the rename it. I used a third party app to import several albums into the iPad but unfortunately the names came across incorrectly. It seems to me that a step was left out. Sometimes when I pull up albums, not all albums are shown. You must select “see all” if your album page is open. Then you will see edit button.